Apartments, 832-34 East 57th Street, Chicago, c. 1900. Courtesy of Kevin Eatinger. The election of Hyde Park resident Barack Obama demonstrated a movement beyond the racially biased notions of what is possible in the United States. 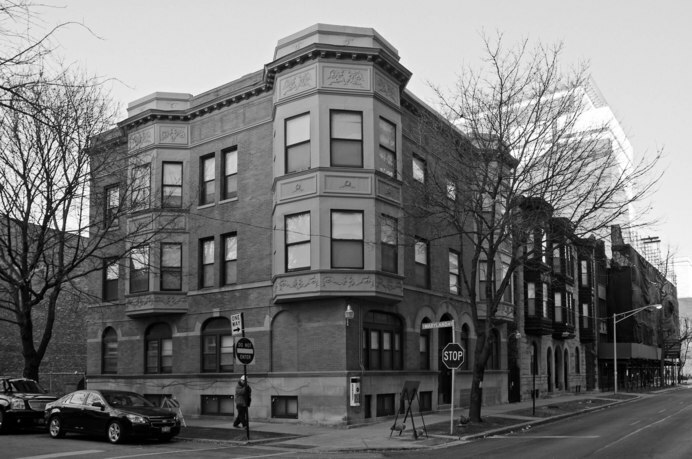 The Hyde Park-Kenwood neighborhood has made a similar journey and provides a rich context for a thought-provoking examination of architectural styles and the area's social and political history. There were many dark chapters in the process, from racially restrictive housing covenants to wholesale clearing of undesirable areas, however the neighborhood is a remarkable example of what can be achieved both in society and in architecture. Beginning with a look back at the very foundations of these two communities, this work follows Hyde Park-Kenwood on its journey into the twenty-first century. Through rarely seen archival photographs, we glimpse a rich architectural legacy that embodies both the thoughtfulness of generations committed to producing work of lasting value and the carelessness and insensitivity that emerged during the area's darker days. Susan O'Connor Davis is an independent scholar and a founding member of the nonprofit Kenwood Improvement Association. After working in the design industry for nearly twenty years, Davis now serves on the Board of Governors at the Smart Museum of Art at the University of Chicago.